Wyoming-made, unique, practical outdoor gear is what we do. We spend our share of days in the field and are aware of the fact that having the right gear at the right time is critical to outdoor successes. The Deuce is no exception. This fly box was specially designed for pre rigged fly setups. 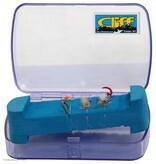 This box allows an angler to tie up their favorite pre rigged setups before hitting the water. Utilizing a hopper-dropper rig or double nymph rig has never been easier. This box is a game changer. Check it out!